The Avalon team went with intention of finding some useful and interesting technology to help our partner schools, so did we find anything? Yes in summary, one of the avenues the team looked at were resources to help with the new Computing curriculum. We are pleased to learn there seems plenty of development around the Raspberry Pi, Lego, Minecraft and Scratch. EarlyYearsWorld provided a fun and appealing start for ages 2-5 into the world of Scratch, which then progressed in to KS1. The Raspberry Pi is a small and low cost device aimed at helping children learn by touching, thinking and doing. They can use the Pi to learn visually programming and in later years in a textual format, by using L.E.D’s, buzzers, buttons and sensors. We saw exciting add ons like the Pi2go robot and Initio robot (below). The ever expanding line up from Lego never seizes to amaze, this time a fun 3d computer program to design a lego world which links in with the students then building from real blocks (aimed at early years). There are a variety of pack sizes for all schools and for ks1 there are a vareity of Lego Mindstorm kits when they can start using engineering skills. 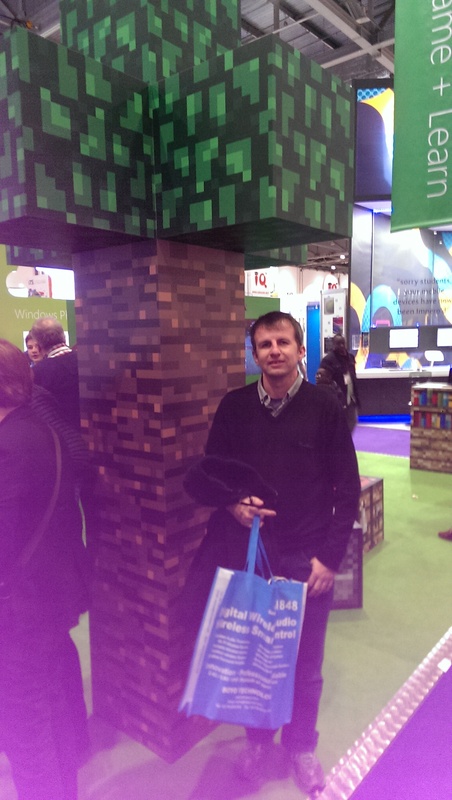 After Microsoft buyout of the infamous “Minecraft”, Bett showcased an example of a teacher using Minecraft to teach primary students about teamwork, problem solving and how they can incorporate this computing resource across the curriculum – Religion, Geography, History, Maths etc. Moving towards hardware we were all captivated by some useful personal and portable projectors. These projectors were capable of showing large images but because of their portability could be used in corridors, staff rooms, offices or even at home. A variety are available, all are low cost, run off batteries and have modern connectors that should work with your laptops, computers or handheld devices. One interesting talk that would appeal to our education partners was from a headteacher who discussed the effectiveness of technology in his school A key point was using mobile devices such as the Microsoft Surfaces for students to record videos or pictures during field trips or even events held in the school. Once they had captured this evidence they were using a combination of a new product call Sway to present their findings along with Onenote or Powerpoint. Another useful mention was using Yammer for staff, this acts as a social type of interaction but in a business environment. – this allows a repository to have conversations or an ideas bank, which maybe useful for staff meetings, curriculum planning or even CPD sessions. The Avalon team were all impressed with the integration of Ipad’s with Smart interactive boards, their new software allowing a teacher to work on their device and present on the board at the same time. This could be really useful in the classroom as the teacher can be facing the students instead of turning their back to write on the screen. These systems now allow collaboration, so students with devices could interact with the board too. Their seemed a number of displays from companies that involved engineering, from 3d scanning and printing to robotics. One such example from a company can be seen in the video below.